Surely I’m not alone in this: When I’m eating starchy foods, I think I should be eating more greens. When I’m eating my greens, I wish I had heavier foods to balance them. And pretty much all of the time, I wonder why it has been so long since I made macaroni and cheese. And this is what happens when I stewed all of these thoughts together in my head over countless feedings. I love sweet potatoes but I find most preparations of them too heavy and sweet (which is why I stick to spicing, curry-ing and/or spicing, curry-ing and frittering them); I love chard but I find most preparations of it too earnest but when I put these together in a gratin I ended up with the most bubbling, gurgling, cooing delight of a fall comfort there could be. To me, this is the best of all worlds: so rich and cozy, it makes your apartment smell like there’s not a single good reason to leave it, but also chock-full of peak season, straight-from-the-market produce that I’d like to believe could not imagine a more decadent way to go out. I won’t lie, Swiss chard can be a real pain to prep, what with the rib-separation and rendering of unfathomable volumes down to a few measly cups of cooked greens. I like to chop, wash and dry mine the day before, but if you’re especially in a rush, I see no reason you can’t swap pre-washed (3 pounds) or even frozen spinach (about 5 to 6 cups). I also don’t see why you can’t swap the sweet potato for thin slices of butternut squash but then you will have less of an exuse to say “yam-yam” to the baby over and over again until he laughs. Finally, if my gratin looks a little “wet” to you, don’t worry, yours — providing you squeeze your greens out well — should not. I just mindlessly baked mine for half the time covered with foil which is not a bad idea for all-potato gratins, not drying enough for greens. Prep greens: Cook onion in 2 tablespoons butter in a wide 8-quart heavy pot over moderately low heat, stirring, until softened. Add chard stems, pinch of nutmeg, and salt and pepper to taste and cook, stirring, until vegetables are tender but not browned, about 8 minutes. Increase heat to moderately high and add chard leaves by large handfuls, stirring, until all greens are wilted. Season with salt and pepper then transfer greens to a colander to drain well and press out liquid with back of a large spoon. Make sauce: Combine cream or milk and garlic in small saucepan; bring to simmer; keep warm. Melt two tablespoons butter in a medium heavy saucepan over moderate heat and stir in flour. Cook roux, whisking, one minute, then slowly whisk in warm cream/milk and boil, whisking, one minute. Season sauce with salt and pepper. Assemble gratin: Preheat oven to 400°F. Butter deep 9×13 baking dish. Spread half of sweet potatoes in the prepared baking dish. Sprinkle with salt, pepper, a quarter of the herbs and a 1/4 cup of the cheese. Distribute half of the greens mixture over the cheese, then sprinkle salt, pepper, a quarter of the herbs and 1/4 cup of the cheese over it. Pour half of bechamel sauce over the first two layers then continue with the remaining sweet potatoes, more salt, pepper, herbs and cheese and then the remaining greens, salt, pepper and herbs. Pour the remaining sauce over the top of the gratin, pressing the vegetables slightly to ensure that they are as submerged as possible. Sprinkle with the last 1/4 cup of cheese. Bake gratin for about 1 hour until golden and bubbly, and most of the liquid is absorbed. Let stand 10 minutes before serving. Do ahead: You can make the entire gratin but not bake it up to a day in advance and keep it in the fridge. You can also make and bake the gratin and reheat it. Gratins reheat well, but they take almost as much time to gently heat through as they do to bake in the first place, especially deep ones like this. As for reheating, already baked and frozen, I will find out very soon! But I am near-positive it will be fine. Yay, a dinner recipe. I’ve been looking for some inspiration, I’ve been getting really bored with all my usual dinner recipes. That looks delicious. Now if only I could convince my boyfriend to like sweet potatoes! I’ve never been a big chard fan to be honest. If butter, whole milk and Gruyere can’t persuade me, I’m not sure anything can. Bookmarked to try! I used kale because it’s what I had, and it was great! SO weird — I served this as a frittata to future inlaws just 2 weeks ago. Great combo. Also, recently discovered Smitten archives and have been having an absolute blast reading the old stuff! Same here! The boy doesn’t like sweet potatoes. It makes no sense! Love this gratin, perfect flavors. That kid is delicious! Cheeks!!! Such a good idea for chard! And I’m sorry, but looking at pics of your baby during the work day takes ALL of my attention and I cannot possibly be productive for 30 minutes after each post. How do people work when there is cuteness like this on the blogosphere? I’ll never understand. I also hate sweet sweet potatoes. I will certainly make this soon. Also, that baby picture is too cute for words. I can`t believe how much hair he has!! I have a load of swiss chard still growing strong in the garden, not anymore! Wow that looks good!! Your baby is a cutie! Wow, that’s some head of hair. He looks like a teacup sized Donald Trump. Uncool!!! Cute baby should not be compared to that quack!!! WTH?! Sounds like a perfect dish! Baby’s growing up!! I’ve just recently discovered that I like sweet potatoes, but just plain with butter, not all that other stuff. This certainly in intriguing and I think I’ll give it a try. I’ll probably go the spinach route. Thanks for sharing the recipe with us. Ah, you’re thinking a lot about balance. As in, I love being a mom, but I want some free time too. :) This looks stupendous. I went a little overboard on Swiss Chard at the market today. How fortuitous to have another recipe to make. Thank you! Wow. That looks fabulous – every bit as tempting as lasagna. And there is still so much chard in the garden. I completely agree that starches and greens by themselves are too much (but they’re two great tastes that taste great together!) I’m wondering (and I always wonder this in similar recipes): is that 3lbs of chard before or after the prep and cleaning? Also the lil’ bean sure is a cutie! We like to go heavy on the nutmeg whenever there’s deep flavors of cheese like this. It’s sooooo good! And of course it works well with sweet potatoes. Of course. What do you recommend, if possible, to subsitute the whole milk/cream? Love your pics of handsome Jacob. I read your blog daily, first time leaving comments. That sounds good – I’ll have to try it soon. Do you do a lot of freezing of food? Sharing of food? Throwing away of food? We also only have 2 adults in the house, plus a 2-year-old, plus a little “yam yam” like yours. So when I make a recipe, it lasts for days. Then I have to stop myself from making other recipes, and I get tired of the first thing I made. EG — I do a lot of sharing of food, and a lot of shoving it on Jacob’s many visitors these days! Oh, and my poor friends who invited me to an Asian-themed potluck tomorrow night? Yep, they’re getting gratin. bg — I am not sure if soy milk works in bechamels. Perhaps someone else can weigh in. Hair — I am happy to see that others are as obsessed with it as I am. So much! It was extra puffy — seems his hair frizzes just like mama’s when it is overcast! I hope it does not fall out. (Mine never did.) I will be very sad. Okay, I have to say this, you have SUCH AN ADORABLE BABY. I don’t usually find babies cute within the first year or so (somebody is going to punch me in the face for saying that), but HE IS THE CUTEST THING. Please lend me your genes. Also, I’m finally glad that someone agrees that most preperations of sweet potatoes are just way too sweet. I find them quite sweet on there own and prefer a spicier or sharp taste to even it out. This looks delicious! Jacob is no doubt the most adorable baby on the planet! 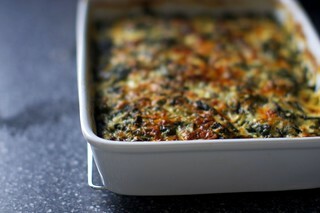 OMG i have been thinking about swiss chard gratin for the past two weeks! for real. this recipe sounds great, the addition of sweet potato would definitely make it heartier and super tasty! wee!! now this one is up my alley!! I still have Swiss Chard in the garden–and the little bub is SUCH a little man! are you feathering his hair?!? WOW…what a mop he has. beware of cradle cap. probably shouldn’t mention that on a food blog, but you’re the one who put the picture of the cutie in the middle of your post! this sounds really good, and i’ve been wanting to try chard. Your little man is too cute! And the dish looks pretty darn tasty, too! have you ever done the swiss chard and bacon thing? cook bacon, add onions and chard stems, then add chard. After it’s all done throw in a handful of dried cranberries. It’s awesome. But chard and cheese looks pretty awesome too. So is Jacob loosing any of that baby hair? or is here to stay? No comment on the food this time…just HAD to say that that has got to be the cutest darn baby boy on the planet! And I already have a cute boy of my own, so I know whereof I speak! I love these things that you post. Love, love them. And I make them for dinner, and I love them even more. And then my boyfriend goes “This is pretty good, but where’s the meat?” Ahem. Go make your own dinner. Deb, you have the most adorable baby boy I have ever seen! I’ve been a fan of your blog for a while now, and I just noticed the seasonal archive- thankyou! I often drool over your posts but living in Australia, by the time summer comes around I’ve forgotten about all the delicious salads etc that I longingly looked at in the middle of our winter. Oh, and I made your pistachio petit four cake for my sister’s birthday and my hubby (who is in denial about his sweet tooth) said it was the most delicious cake he has EVER eaten. So thanks on all fronts!!! The chard and sweet potatoes look delicious – but baby takes the cake! He’s gorgeous! Who cares about the Swiss Chard, look at the baby! This sounds really good. I have Swiss Chard in my refrig right now and had no idea what to do with it. I will try this and share with my students. They have no idea what Swiss chard is. We discussed it today in class. Thanks so much! Try baking cubes of sweet potatoes with sliced onions in a wee bit of olive oil, salt and pepper on them. Use a rimmed cookie sheet. This produces a totally different sweet potato taste. Use a “regular” onion, not a sweet one. I time these based on whatever else I’m making…….and heat the oven to match whatever is already there. But about 20 to 25 minutes at 425 if you are in a rush. Wow. What a showstopper fall dish. That would be great as a Thanksgiving side…. My local farmshare chard tends to have grit in it, so I am required to wash it very well. But, I spin mine in a salad spinner after washing to get it dry quickly! Your little boy is the cutest thing I’ve ever seen. And his HAIR! Oh my gosh…his hair combed like that is freakin’ adorable. Moving on…I totally agree with you about the starches with vegetable pairing. I wonder if putting vegetables in my mac and cheese might do the trick! I love a sweet potato gratin (and much prefer that over cloyingly sweet sweet potato dishes for thanksgiving sides), but never thought to add greens to it – will definitely try this, probably for Thanksgiving dinner this year! looks delish! i too cannot *just* eat veggies. Always feeling satisfied afterwards. Give me some umph! Oh my! Chard, cheese, cream and sweet potatoes, it looks so yum or should I say yam-yam to get a smile from that adorable boy. Definitely a Turkey Day addition! Not only does this look completely delicious, but it looks like a great excuse to buy a mandoline, which is also on my wish list – perfect! I’m with you greens need starches and starches need greens. What a beautiful way to make them coexist. Oh, yum… double yum! This is EXACTLY what I was craving at this moment — and didn’t even realize it! Do you think Tuscan Kale would work, too? I just checked and I have all the ingredients for this, including the chard which is growing in the garden – rainbow chard. And its an unseasonably cold late spring day here. I can’t ignore the signs. Am making this tonight. Lots of veggies and lots of hearty! Will definitely be trying this. I will also echo the others – your baby is particularly cute. He is my favorite blogosphere baby right now. Love the dark hair. I’ve bookmarked this to try. Cheesy sweet potatoes sound irresistable–perfect for a cold day. I absolutely adore greens of any kind so this must go on the list. I could make it tonight except we have no sweet potatoes. Guess I’ll have to try it with regular potatoes instead. My wife loves chard and it has become infectious within our family. We have two rows of chard planted in the garden. It is easy to cultivate and it is one of those veggies where fresh from the garden makes a big difference. This dish will probably be on our Thanksgiving table. But, try it with a little Prosciutto and a splash of balsamic as well. It is a veggie that rewards contrast. He is so beautiful! He is such an angel. Now I have both a way to use up the random chard and kale in my refrigerator and something awesome to make for dinner tomorrow! I may throw in some ham, too…truly make it a one-stop dinner for the “it’s not a meal if there’s no meat” member of my household. Hmm…. not sure which one I want to eat more: that lovely gratin or that gorgeous baby! Oh my goodness. Look at all that hair on the little guy….adorable! This gratin is looking great too. I will take savory sweet potatoes over sweet any day. Looks yummy – both the food and the baby. My only question is what other kinds of cheese do you think might work? No kosher Gruyere to be had where I live, so any suggestions? Sara — I’d use a Swiss or Emmantel or Comte or such. Lordy, that little one is so cute…..wish I could kiss that sweet face! My daughter is coming home soon, and yes, we will add this to our cooking experience! I grew up eating Swiss chard “au gratin” in France. We would put regular potatoes with the chard so that we could get that “starchy” feeling you describe in your post (and please the ones who did not like greens that much!! ).Now that I live in the US and discovered sweet potatoes, I use them as well. I have come to making more Swiss chard recipes than just “au gratin” so that my children would eat them (you’ll see in a few years!!). Alternatively, I use cauliflower or broccoli to make “au gratin”. In order to reduce the cooking time, I steam the veggies first then put the Bechamel on top and just broil the gratin for 15 minutes. Maybe not as tasty but great for busy moms (and dads)! Can swiss chard be substituted with kale? Oh my god, this looks delicious. I saw someone else blog about a sweet potato and arugula gnocchi, which I’ve been craving all week. Now this. I think a sweet potato and green thing recipe will be on my agenda for the weekend. Yet another one to put on the ‘make tomorrow’ list, so many recipes so little time. I actually make sweet potato oven fries for dinner tonight, I am on an all things orange bender, I think it’s just that season again. Hard to believe, isn’t it? This may sound obvious, but this seems like a great thanksgiving side dish. Do you think this can be frozen and then reheated? Looks delicious! I have to agree on the heaviness of sweet potatoes. I do have a thing for sweet potato casserole, but I view it as a course to be eaten after dinner and before dessert, in a category all its own. This is the kind of savory that needs to find its way to my Thanksgiving dinner. I love both of those! Sweet potato is one of my favorites and swiss chard is delicious in so many things! Could I use soy milk, vegan butter? Would this change the recipe or make it flop? It looks amazing…and would love to make it vegan. i find myself checking your site just as much for the pictures of adorable baby jacob as i do the awesome recipes. between his little outfits, his expressions, and THAT HAIR, i could basically squeal aloud. you seem to be doing a wonderful job balancing everything- hopefully it’s going as easy as it seems!! wow, the 2nd recipe in a row where i’ve had the ingredients! sweet potatoes and greens are our favorite meal. what a neat twist. i will try to veganize it. thanks! I sit on the edge of my chair and really want Jacob first…he adds so much to the food scene all he needs is a “pointer” in his hand directing. He gets cuter by the minute. Your food ideas for this fall are wonderful, comforting and taste good. All the root veggies are so plentiful and so good for us. The gratin is a real winner! Where did Jacob get all that hair!!! He looks like a cute little man already! congratulations on such a handsome boy! I love this kind of dish… Yum! My son also had hair like that! People in the hospital kept asking me if he was a newborn, like, duh! What would I be doing in a maternity ward? The downside (as you may have already figured out) is that total strangers will want to touch his head!! This is beautiful! I can’t wait to give it a try. I truly adore your site! Every recipe you post I can’t wait to try. By the way, I made your Brown Butter Rice Crispies 4 times since the post…Yes, my family likes them that much. My four yr. called for them in her sleep. LOL. Ooh, sounds wonderful! Might have to mix things up a bit and serve this with Thanksgiving! Mmm, this looks like the perfect autumn dinner. Oh, and that head of hair! Amazing. I am going to make this forsure, sounds wonderful. Your little man is dreamy, super cute, thanks for the pictures! Looks like a great side for Thanksgiving. And that baby, oh my goodness!!!! Yay! I was looking for a sweet potato dish for thanksgiving and I felt there wasn’t enough green on my menu. Now I can kill two birds with one stone! I just discovered your blog a few months ago and every single recipe I have tried has made the family swoon. You’ve even helped me find the confidence to make my own pies this thanksgiving (great tutorials by the way). Just wait until Jacob is old enough to try your food and help you make it. It will make cooking all the more enjoyable. oh, and there is no way that gorgeous hair is falling out. Looks too thick. Both my kids had hair like that and they never lost it. Love it. You have rounded out my Thanksgiving table. Thanks!!! This is going on my Thanksgiving table! I have a similar recipe for a kale/swiss chard gratin, but I LOVE the addition of the sweet potatoes. What a treat! Now, if only I can borrow a baby to say “Yam yam” to…. Deb – would it be okay to use regular (not frozen) spinach in this recipe, or would that be too wet? Ashley Gail — I haven’t tested it with those ingredients. If you do, please let us know how it went. Many want to make the same substitutions! My hunch? Might just work fine. Christine — Either start with 3 pounds of fresh greens or 5 to 6 cups rendered (or frozen, which have already been washed, chopped, blanched). Cannot wait to try this. My kids love Swiss chard but I have yet to get them interested in sweet potatoes. Looks seriously tasty! Baby, so cute. Gratin, so yummy. As for the greens & starches thing, I fully agree and I’ve had a craving for mac and cheese that is ridiculous. I tried to satiate with a creamed brussel sprouts experiment. WHAT was I thinking. (although they were delicious). Ooh, yummy! I make an almost identical gratin with sliced butternut squash and parsnips.I recommend it as a great make-ahead dish to go with the Christmas turkey as you can pre-bake it up to 2 days in advance and just reheat on the day. The leftovers make a great lunch with a light green salad. What a head of hair…he’s too cute..
Looks gorgeous! Can’t wait to try this and of course will add a few chili flakes, de rigeur (sp?) for me anymore. That hair is fab on one so young! Looks great! 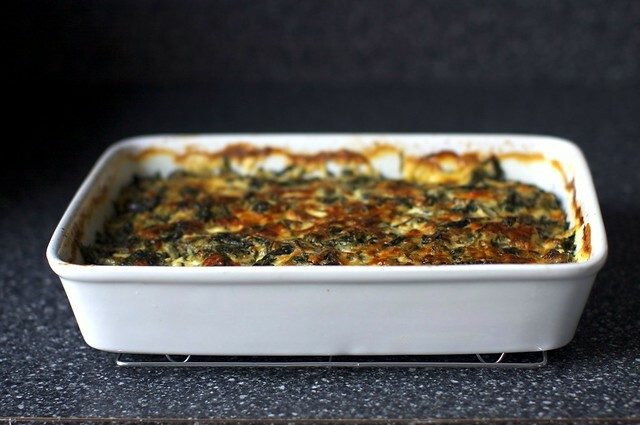 Reminds me of dinner last night – Savory Vegetable Bread Pudding with Swiss Chard. Was yummy also! Thanks for the idea. I just wanted to add a possible short-cut for the chard prep, in case you haven’t heard this one before. I haven’t yet tried it with chard, but with kale you can grasp the stem end in one hand and pull the green off with the other – just slide your hand down the stem, pulling the leaf off. It works beautifully with kale, so I hope it works with the chard, too, because I want to make this over the weekend! i have a question- how the heck does you baby have SO MUCH HAIR! Sounds wicked good, gratins are the bomb. I know what we’re having for dinner! I’ve said it before but I’ll say it again I love the color in your food but also that I can take your recipes and tweak them a bit to make them mine! I might just use kale and leeks since I have them on hand. Thanks for the great recipes! Love seeing your little man! I am on a cleanse that involves avoiding dairy right now, and while I am feeling great, this is going to be one of the first things I make when it is all over in January. I have a hard time getting my husband and boys to eat sweet potatoes or squash but they love greens and cheese respectively. Maybe this will become my “orange magic bullet” recipe to get that beta carotene into them;). Thanks! I love your description of chard recipes as “too earnest.” You’re right, they generally are. I’ve made chard gratin many times but adding sweet potatoes is inspired. This may end up on our Thanksgiving table too. Lord, that child is precious and I’ll bet he doesn’t have chicken legs anymore!! Your baby is so precious! Love the full head of hair. It’s kinda scary (intercontinental telepathy?!) but great that you just made this gratin: just yesterday I was looking for new chard recipes… now I must give your gratin a try (especially because I think I haven’t eaten sweet potatoes yet in my life). So cool! How is it possible that your child is THIS cute? And how is it possible that, for the first time in my life, I want to cook and eat chard? While the food is tasty and I am a vegetarian looking for Thanksgiving food, I really can’t concentrate on the food at all when your cute little boy is staring at me! Chard, ye strange and unbefore-heard-of greens, I know not what shall become of thee… :) But Jacob? 3 Words. Yam-Yam-Yam. :) HA! p.s. – Deb, I want to dive head first into this gratin and just spend the weekend there. ;) Seriously, it looks so comforting and delicious. Chard is sort of a pain but one thing I love to do with it is to put it in a pan with sausage, garlic and olive oil and some hot red peppers. Cook it all down and put it on pasta. I look forward to trying your gratin. Sounds delicious! Thanks so much for sharing your little guy with us. He is so sweet. I torture myself with the same thing when I am eating greens or starches…I definitely like to have both in a meal. I’m studying holistic nutrion, so “balance” is basically my motto. And the babe is marvelous! You are most definitely NOT alone on this statement: “When I’m eating starchy foods, I think I should be eating more greens….” I agree completely and love the idea behind this gratin…thanks Deb! RE: getting sick of dishes, freezing, and/or sharing… I never seem to have that problem as my husband eats all our leftovers in a day or two, yet doesn’t gain weight. Not fair! Also, I have frozen a cooked zucchini gratin before and it defrosted and reheated beautiful a week later! Thanks for another great recipe Deb! Swiss chard, sweet potatoes AND cheese? It doesn’t get any better. You have managed to capture three of my ultimate favorite ingredients and allowed them to make whoopie. I’ve gotta try this. Soon. novice question here: is there a reason so many recipes call for you to remove the part of the stem that runs all the way up through the top of the leaves from kale or chard? Ashley — It’s not removing it per se, or not to discard it. It’s because the stems take longer to cook, maybe 8 to 10 minutes, and if you cooked the greens that long they’d be mush. I have also been thinking for the past several days why I haven’t made crack ‘n’ cheese in so long. Do you like that epicurean cutting board? I love mine, but sometimes it gives off a weird smell. Also, I adore Jacob’s hair. Will have to try it out as soon as possible. Tomorrow!! What a great recipe, I simply adore swiss chard!!! I will make for my x-GF coming over for dinner. I spent nearly an hour today at work reading this beautiful new food magazine called Poetry of Food, poetryoffood.com, amazing writers and recipes. The food & travel section got me especially all the Italy travel. Ooh — I just made this with red chard (no white available) and it came out the most beautiful shades of reddish pink and green and cream! I can’t wait to make this for my folks at Christmas! I love his serious little look…adorable! That baby is gorgeous – what a delight to find him smack in the middle of a recipe. Just makes my day. Sounds great! I’ll probably use kumara (which is the Kiwi version of the sweet potato) — but do you have a suggestion on what to substitute for the swiss chard? Our seasons are opposite to you northern hemispherers, so we don’t have swiss chard now (and they only sell things in season even at the grocery stores). Also, I was wondering if you were going to think about posting recipes that would be baby/toddler friendly, too? I might try to feed this one to my 10.5 month old and see if he likes it! Wondering if you have any suggestions on veganizing this recipe? I’d initially think some nutritional yeast & tofu…but not too sure. Anyone have suggestions? Re: Amanda’s veganizing question, I’d think that making a white sauce with nondairy milk, oil or “butter” and flour would work well in this. I like the idea of nutritional yeast instead of the cheese (I’m not a big fan of processed anything, and vegan “cheese” is nothing if not processed). The combination of chard and sweet potatoes really appeals to me, too! Deb- looks perfect! Will make soon. Em (136)- I’m in New Zealand too, and swiss chard is called silverbeet here. It grows year round and it’s in our garden right now! Spinach is also in season here in case you can’t find silverbeet. Happy cooking! Looks delish and the gratin looks good too! I think he’ll be gnawing on some yams before you know it. Ever thought about making your own baby food? I’ll bet I’m only the zillionth reader to suggest that! Just a thought. I am ambivalent about swiss chard, but this does look temping. I love anything that involves swiss chard and despise most things that involve sweet potatoes. But, your recipe arrives just in time, as I only recently discovered the joy of savory sweet potato dishes. It’s in the oven as we speak, and I can’t wait to eat it. ok, that was quite possibly one of the best meals I’ve had in a very long time. I will most definitely be making it again… and again… and again. Looks amazing. I’m going to use some of the tips posted above to veganize it. Made it with the spinach last night for my poker group. It looked scary sloppy, but they raved like I have not heard from anything else I have made. Everyone wanted the recipe. made it last night with kale and beet greens, it was soooo good. Had it again today for lunch. Thanks for the terrific recipe. I forgot to drain the greens, so mine is a bit… juicy. But nonetheless, this is freakin’ amazing! got about 10lb (!!!) of sweet potatoes in our CSA share and a big bag of spinach (sadly, no chard), so i tried this recipe out tonight. it was a sweet and cheesy fave at the potluck party we went to and not a bite was left in the pan! thankfully, i made another for just my little fam – it’s in the fridge for tomorrow. your little man gets sweeter and yammier by the day. i sighhhh everytime i see a new picture of him. sooo lovely. this looks like it would be really good wrapped in some phyllo dough. sort of like a potato-chard spanakopita. I agree about wrapping in phyllo (filo), I think it’d be lovely! Have grown chard for many years in memory of my late mother in law—only SHE ate hers and I grow mine for looks–have never cooked or eaten it. hmmmm Sweet potatoes now—got some lovely small ones last time at the farmers market. THAT baby continues to be absolutely darling. He is a very cute sweet potato. It’s funny… whenever I eat sweet potatoes, I crave the mineraly-goodness of spinach, and vice versa. What a wonderful way to combine both tastes! Reminds me of one of our dinners last week – spinach frittata, finished in the oven, of course. Yum yum! What a perfect combination! I will be able to use that overabundance of chard I have in my garden still!!!! I cannot wait to make this! It looks like such a lovely combination! and I will be able to use up all my swiss chard in my garden still! I too am not fond of sweetened sweet potatoes (or winter squash), and this looked fabulous. And it was–I cooked it for lunch this afternoon. About eight years ago the NYT had a recipe for a gratin of sweet potato with lemon. I got excited until I realized that it involved a sweet lemon syrup. I ended up using lemon in (unsweetened) broth, and liked my version a lot. But this one was infinitely more interesting. persimmons are everywhere these days, flooding the grocery stores and flooding my kitchen because my mother’s hachiya tree produces HUNDREDS each year — please please please, tell me what to do with them!! you never see enough persimmon recipes these days! I was wondering can I use a salad spinner to dry the chard. Hi Jackie — I did! I just made this and it is the best incarnation of sweet potatoes I have ever had. My wife and I are both deeply ambivalent about those starchy tubers, but this might convince me that the fault is in the cooks, not the veg. I made a halved recipe to test out for Thanksgiving. I bought too little chard so I added some nice turnip tops that came attached to one of our farmer’s market purchases (luckily). I used half-and-half instead of cream and dried thyme instead of fresh ’cause that’s what I had available. So my chard stems were more like stalks and made the veggies a little bitter. But after all the prep work I lose perspective on the finished product. It’s getting nothing but rave reviews from my family! i put this together tonight with plans to bake it tomorrow — i can’t wait to taste it! in your “mise, mess” photo, i think i’m seeing that you have the sweet potatoes in water. does that keep them fresh for a while longer? Jacob is beautiful! Love, love, love this post, an adorable baby and an amazing recipe! Mine is cooking as we speak and I feel like a kid at Christmas waiting to open presents! I bought some beautiful chard at the Farmers Market this morning and honestly could have just eaten that and been ectastic, as what I sampled was fantastic. I almost hoping my husband and kids won’t like it, so I can have left overs for lunch all week. I just don’t know how you do all you do. I was lucky to get anything on the table when I was a young working mom! 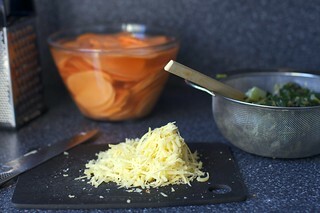 Swiss chard, sweet potatoes and gruyére cheese are in constant rotation in my kitchen. This is such a delightful way to combine the three! As a victim of starch-driven urges, I can’t help but dream of eating leftover gratin on sourdough toast for breakfast. Lovely! As others have commented, this was beyond delicious. I cut the recipe in half (using a 9×9 pan) and ended up eating almost the entire thing with just two of us! My husband hates sweet potatoes, and I love them, so I used both, placing the sweet potatoes on one side and the regular potatoes on the other. We both won! Yes to so many things–chard is a pain to prep (I have a giant row of it in my garden still) but worth it; yams are sweet already, so why do people sweeten them? !–and yes to that baby photo. I’m glad I’m not the only one who shamelessly displays my children on my “food” blog. awesome! i made it, with spinach instead as my grocery store didn’t have chard, and a few other modifications. it was amazing! just delicious! the girlfriend loved it too (so bonus points there), not too much prep, easy. thanks! this looks great and I am thinking about trying it for thanksgiving – but with 2 kiddos – one who is a “helper” and the other who is not yet crawling – I would love to make this ahead – anyone have an idea how this would do made ahead (but not baked) or even frozen ahead of time? also does milk or cream make much difference here? piba — There are “Do Ahead” directions at the bottom of the recipe. This looks delicious – I can’t wait to try it! Looks awesome! We used up all our chard last night otherwise I’d be on it! Yum! I cut some swiss chard from the backyard yesterday to make this, but didn’t have enough yet. Grow little chard, grow! Would this recipe work in a crockpot? Roger that! Saw the picture and had to make this today! I’ve never seen chard in Japan so I used spinach, and it was delightful. Many thanks. This look delicious. Interesting take with the sweet potatoes. When my garden was producing a lot of chard this season I made a swiss chard lasagna that was delicious. That’s what this remind me of but I bet the sweet potatoes are a perfect twist! I made this recipe for dinner last night and it was wonderful!! A perfect blend of sweet and savory. The recipe makes a fair amount, but both my husband and I loved it so much that there isn’t much left! I know I’m a bit late to comment on this post and I don’t know if you’ll read this but can I just say that I love your Best Birthday Cake? I picked it for my first attempt at a two-layer cake for my own 22nd birthday yesterday and it was just perfect. Everyone loved it and it was a great conversation starter (it turned out humongous! I fed 20 people with it and still had a big slice for myself for today). I made this last night for dinner–outstanding! One tip in the chard prep: I used kitchen shears (aka scissors) to remove the chard from the stems, then used a hefty knife to chop the leaves. Using the shears was much easier for stem separation than a knife. My wife is a vegetarian, but if I was making this for some carnivores I’d take the drained chard and sautee it in butter for a few minutes along with some pancetta. I think the salty pork would really compliment the sweet potatoes. Also, it pays to use really, really good Gruyere for the top. I took a chance on some at the supermarket, and it really helped the cheese crust. I’d actually recommend using another 1/2 c. or so of shredded Gruyere for the topping, so maybe use 7-8 oz of cheese at the outset. All in all, a terrific recipe. I will try this soon.. Excellent pics…. Made it yesterday – outrageously yummy! I’m not the meat-free-Monday-type and I would definitely go for it with this dish! I concur with Dave J. – Trader Joe’s only had Gruyere in approx. 1/2 lb. blocks and I felt it was the perfect amount for this dish. The person who mentioned substituting soy milk for the cream, I’ve made bechamel a THOUSAND ways, and it’s very forgiving. You need a genuine fat to saute with flour however (true roux recipes call for oil rather than butter), so I’m not sure how vegan margarine would work. Bottom line – it’s all about the roux and of course whatever flavor you’re after with the bechamel. The two-step stem/leaf system worked like a charm and absolutely you MUST drain, drain, drain! I was shocked at the amount of liquid that came out and I still had a bit on the bottom after assembling and baking (though I thought just enough). Will be forwarding this to my veg friends – such a hearty dish with great flavor – great job!!! This sounds perfect for Thanksgiving! Unfortunately, I’m committed to making lasagne this year. Hmm, maybe I will have to get some chicken breasts and roast them up and make (a smaller version of!) this and have an “early” T’giving for me and hubby. Nice to see non-sweet sweet potato recipes — I have never been a fan of all the sugar and crap that most call for. And speaking of a sweet potato, that’s still one adorable baby you’ve got there! This looks like heaven in a dish, I’ve got to make this! oh, and your little helper looks super adorable, he’s going to be such a help in the kitchen! I made this for dinner immediately after reading the post. It tasted amazing! I wanted to test it out as a potential Thanksgiving side dish and I think it will have a place on the table. I also added some cumin while cooking the onions and stems together which added some good flavor. Wow- This dish rocks. I ate my leftovers (which were supposed to be for lunch) at 10, and have been in a Monday work-haze dreaming about this dish ever since. This would make a great “nontraditional” thanksgiving side, especially for those people who do it potluck style. How funny, I was just thinking about making a sweet potato gratin with kale for my blog! Looks delicious! I have a general comment about that gorgeous child of yours could you make a category for posts with photos of him or a link to the photo album he IS just such a doll. Keep up the great work lord knows how tough it is to get ANYTHING done with a newborn we are all in awe of you. Deb, you have outdone yourself this time. The flavors are amazing! The sweet potatoes soaked up the flavors of the garlic and butter so nicely. My meat-eating husband also shared with me he’s always loved chard, so I thought this would be a great way to present it. I assembled this dish a day in advance before baking. I don’t think I squeezed the chard enough when assembling, as the dish overall seemed rather juicy (even with extended cooking time), but still tasted fanstastic. I will definitely make this again. I am the 197th comment! wow! Great dish….and cute baby, at least the picture. Recipe fits for vegetarian like me.And also your baby is cute. And would you look at that hair… he’s perfection too!! I’ve never been a fan of sweet potatoes, but this combination just might change my mind! Holy Moly! I made this for lunch this afternoon and it was delicious! I think this may be my contribution to my family’s Christmas pot-luck. I don’t think I’ve ever cooked swiss chard before, and I’ve never made a gratin from scratch (although I’ve made lasagna, so kind of the same principle). I added too much liquid because you had mentioned pushing the vegetables down so that it was as submerged as possible. It was a little liquidy, but well-seasoned, so it didn’t lose all the flavor in the sauce. Also, I’m glad I sprung for a good Gruyere, the flavor shined through without having to load the whole thing up with tons of cheese. I just made this with soymilk, and I though the bechamel looked good. After cooking, the dish was pretty moist and didn’t look all pretty/creamy like Deb’s picture. I didn’t mind because it still tasted great, but I’m not sure I would present it for many others. Maybe the greens were too wet? Amazing combination, though. Lovely! How I wish I’d thought to add some greens to lighten up this gratin. This was fantastic! I made it with a very large mystery squash instead of sweet potato, which let off a lot of liquid so it was pretty soupy, but still incredible. Loved it! I’m wondering what anyone thinks about assembling this a bit ahead of time. I’d like to use this for Thanksgiving but ideally I’d like to get it oven-ready on Wednesday, refrigerate it overnight, and just toss it in the oven an hour or so before the meal. Any pitfalls in this plan? Anything I should do differently? Thanks for any advice! Made this for dinner tonight and OH MY GOODNESS it was SOOOO good! i already cannot WAIT to have it for lunch tomorrow at work! Benjamin – I made this half a day in advance, and had no problems. I’m sure you could make it the day before and have it be just as tasty! I baked mine in a pie pan. it was so so amazing. surprisingly light – but i did only use about 3/4 of the sauce. Made this last night and it was amazing. Used butternut aquash and spinich and had fresh tarragon which really made the dish! The only problem is no leftovers! This was awesome…you made me look good once again! Thanks! oh, and I am *smitten* by your little boy…he looks so much like mine did, makes me long for those early days…sort of. This recipe rocks!! So delicious — like lasagna but devilishly healthy! Thank you! My boyfriend and I followed your recipe with just a few minor changes (mainly kale instead of swiss chard), and I have to say it was phenomenal. My boyfriend loves the “bitter” of greens, but I am less of a fan, and both of us can find sweet potato too sweet in the wrong recipes. But here they balanced each other out absolutely perfectly. Amazing recipe! Deb, how did it fair when you reheated it after freezing? Speaking of freezing…did you freeze any meals while you were pregnant for those crazy first weeks after baby? I am due with my first baby in March and am hoping to stock my freezer. Would love your suggestions as for what to make! Cindy — I, uh, forgot to try it but everyone else loved it. I didn’t prebake/freeze meals, but in NYC it’s really easy to get any food at any hour so I wasn’t worried about being devoid of decent meals. Perhaps some stocks? Some dishes you never get tired of? omg! i’ve never commented on your site before even after trying at least 10 amazing recipes – but this one takes the cake! I made this for dinner and have a new favorite veggie dinner, AMAZING! Thank you so much! Love your site and your adorable baby! I made a half recipe of this last night and it was delicious. I’ve been getting lots of chard from my CSA box this fall, and this has definitely been one of the best preparations I’ve found so far. A word to the wise after this chard-filled season: don’t forget that the red pieces in rainbow chard turn everything pink. I learned this lesson as I ate a bowl of “creamed chard” that was delicious, but looked like it was swimming in a pool of pepto bismol. Did you use the red swiss chard or the green swiss chard. Thanks for such a wonderful recipe! While the Swiss Chard was a pain to prep, the meal was delicious!!! Definitely take time reheating though – i nuked mine too fast and it ruined my leftovers. This is the first recipe of yours that I’ve done (although I have several many bookmarked for future use!) and it turned out great. I’m sort of terrible at not being an airhead sometimes, and one of those times was when I went to the grocery store for these ingredients. What I ended up getting wrong I used anyway and it turned out GREAT. Fresh Swiss Chard turned into frozen, chopped kale. Gruyére turned into smoked Gouda. I’ll be posting about it on my own blog later today. I made this and wrote about it—it’s out-of-this-world good! Thanks oodles. I made this for dinner last night and it was oustanding. I only had fingerling potatoes in the house but it still worked out well. Perfect hearty dish for a vegetarian. Enjoyed with a glass of wine. I’ve had this made with kale before but I think I prefer the chard. Made this tonight with my 7 and 10 year old sons and all I can say is YUM!!! It was the perfect balance of sweet and savory and the cheese just made it all the more perfect! looks warm and filling. baby is also the most adorable thing every! LOVED this recipe! Followed it fairly closely, but skimped on the chard (only bought one, but should’ve used two bunches) and switched out the sweet potatoes for Hubbard squash. Turned out AMAZING, if a little watery — possibly due to my other change: used 1 1/2 cups soymilk + 1/2 cup cream for the milk. Deb, thank you so much for sharing your wonderful kitchen with us… and for doing it all with one hand tied behind your precious little munchkin! Sooo delicious! Thank you for the awesome recipe (and I don’t even like gratins!). Thinking about making it as a Thanksgiving side. And thank you for the baby pics! Our baby boy was born a couple weeks before Jacob and is a total baldy! just wanted to say i made this last week and subbed a bag of mixed southern greens (like turnip and mustard greens, kale and some spinach) and it was really good. the strong strong greens really stood up to the cheese and cream. nice. this looks delightful, making it for thanksgiving for sure! this was so tasty! i used spinach instead of chard. i attempted to half the recipe but i ended up with not enough sauce. but all the flavors were there and it was so delicious! thanks! Thanks for a fabulous recipe! Spinach worked quite well yesterday when chard was obscenely expensive. I know you’d frown, but it was pretty good with skim milk too. Just made this tonight and it was fabulous! I served it with a lamb shoulder and despite the very good meat this was the first thing gone off everyone’s plates! I’m going to add more chard next time, as I got lazy this time and didn’t quite make it through all 3 pounds. This is the perfect warmer for a cold winter night. I’m making this tonight! I made this exactly per the recipe – covered for the first 30 and uncovered for the last. It was perfection! I have a question/feedback. I followed the recipe but my dish had no . . . structural integrity. Instead of looking like a layered, lasagna-type dish, it came out kind of sloppy and saucy. Tasty, but not quite what I thought it would be. Any thoughts about where I might’ve gone wrong? Also — just a warning for others. My swiss chard was absolutely filthy. I washed it twice, but it could’ve used a third and fourth wash.
Deb — Usually, it would come from either too much moisture in the greens or a sauce that didn’t thicken enough. Or a higher sauce to vegetable ratio, though that’s less likely. That’s all. I made this Saturday night for a dinner party and it was enjoyed by all who loved sweet potatoes. I accidentally misread “cook the stems” so I didn’t – just wilted the leaves, popped them in a colander and let them drain for a few hours. It wasn’t too soupy but if I had remembered the stems, I’d probably add some more bechamel because my 2 cups got eaten up pretty fast. Very attractive dish, as well. I cooked this last night. The swiss chard was a pain in the tuchus to prepare, but this has to be one of the most delicious things I’ve ever made. Delicious! I put chopped hazelnuts on top and it complemented the gratin quite well! I saw this today and just have to have it for Thanksgiving. It looks amazing. I love this blog and nearly everything I have made–ranging from easy to difficult–has been excellent. Thank you, Deb!! My mom, however, thinks these potatoes look “too healthy for Thanksgiving” and that the relatives will be disappointed with it. Can you believe that? She prefers the marshmellowy, uber sweet, heavy and sticky version. Boring. Haven’t we had that every year since I was born? (I’m now in my 30s). So I have decided to have a sweet potato cook off. We will see which dish is the most popular on Thursday…I’ll report back with the verdict. Made this as part of a light(ish) lunch for friends on Sunday. Swiss chard/silverbeet’s just about to go out of season here (it’s almost summer in Melbourne) but there was still some available. Thanks for another gorgeous recipe! Cutest baby ever! I’m prepping the chard for the recipe now and I’m concerned–all we have in Seattle this time of year that I could find is red chard and the stems are thicker than my thumbs. The leaves are large and leathery, too–nothing like the tender, young, baby (did I mention he’s the cutest baby ever) chard you show in your pix. I think I’ll leave most of the stems out and just sautee the greens down. I never did like the big stems anyway–they feel squeaky in the teeth. Ew. Alison — Just cook them a little longer. The stuff I found was unusually baby-ish at the market; I usually find the other. What a great new way of doing gratin! Great blog and wonderful recipe ideas. I teach on a few cooking Holidays around the world and I will definitely be recommending this blog to my students. This looked so delicious I made it for a dinner party the other weekend. It was so delicious I’m making it again right now as a Thanksgiving side for tomorrow :-) I used butternut squash instead of the sweet potatoes as my mom had a TON of squash in her garden. Thanks for the awesome recipe! This dish just popped out of the oven and is on its way to a Thanksgiving feast! I’m more excited about the chard than the turkey (which may say a little too much about me), and everyone to whom I’ve mentioned this dish promptly began drooling. I can’t wait to try it. Thanks! Fantastic timing, Deb! I just bought a few yams to bake, but because I’m too lazy to cook veggies regularly I also needed to find something green. With a piece of the brisket I’m starting to contemplate, this will make a nice complete lunch. I saw an answer you gave above about quantity but remain completely confused. Is 3 pounds the final, trimmed amount of greens that goes into the recipe, or the un-trimmed quantity? Hi Lenore — 3 pounds is the untrimmed quantity, or what you want to go out and buy — you can exchange it for 3 cups of pre-washed fresh spinach (which I now realize would be a little more in the end, but those baby spinach bags cook down to far less than Swiss chard so perhaps it would make no difference) or 5 to 6 cups cooked and squeezed out (spinach or really any greens). we had this for thanksgiving dinner tonight and it was absolutely yummy! i’ll definitely make this again! This was the trifecta of my SmittenKitchen recipes for Thanksgiving–the upsidedown apple gingerbread and the buttermilk sweet potato pie being the other two. I had to make a wee bit more bechamel for this, my first batch went and reduced on me a little too much. (Danged electric stove anyway.) I used only the tiniest of the stems and minced them super fine, also. The adults raved about the casserole, but the best compliment was from my 8-year-old niece Emma–she had two helpings! My mother was quite pleased, too. We will definitely feature this for Thanksgiving next year. Just have to tell you that this was the HIT of the Turkey Day Feast last night! I actually used a mix of Swiss Chard, spinach and other winter greens that I got from my CSA share this week, extra garlic and a really ripe Grueyer – even the kids liked it. This is a winner!! Thanks Deb! Loved bringing this to Thanksgiving dinner! I will make this again and again. Folks loved it and we’re referring them to your site for the recipe. This was a HUGE hit at the thanksgiving dinner I went to yesterday. I substituted frozen spinach for the swiss chard because I already had it and it was still awesome. Everyone raved about it at the dinner. When the cover first came off, I saw a couple noses turned up. But once the first person took a bite, it was all over. Everyone kept asking, who made this. Thank you so much for sharing your recipes. You truly made me look like a rock star. Made this for Thanksgiving and it disappeared VERY quickly! I am in Mexico and had limited options for ingredients, so I subbed spinach for the chard and manchego for the gruyere. Came out great! Hi Deb! Thanks for the recipe- I made it for group Thanksgiving last night and it went quickly! I also used a 1/2 lb of gruyere and added about a cup extra bechamel (mine cooled too long and didn’t spread well). It was awesome, and your baby keeps getting cuter and cuter!!!!!! That looks amazing, I’m craving vegetables and want something properly tasty so i’ll have to try it. I ended up making this for thanksgiving and everyone loved it- even my boyfriend who doesn’t like sweet potatoes. although this dish took me 4 hours to prep, it so was worth it!!! everyone loved the how the swiss chard and gruyere cheese complimented the sweetness of the yams. my baking pan was scaped clean! i’m excited to try this dish with regular potatoes and cheddar cheese…mmmmmmm! A friend of mind brought this dish to Thanksgiving and everyone raved. So I made it myself the following night. Used whole milk, the rest of the chard from the garden and a bit more nutmeg and cheese than suggested- and it was wonderful. Thanks for a great recipe! I’m living in Argentina now, and I had to think outside the box for Thanksgiving this year since many traditional ingredients are unavailable. I made this dish as one of my sides, and everyone raved about it. It was delicious (albeit a little heavy on the prep), and I would make it again in a heartbeat exactly as it’s written. Thanks for this great recipe! i made this for thanksgiving using rainbow chard from the garden and it was great! my only problem was that it was wet on the bottom … i had to cover it for a few minutes to get the sweet potatoes tender, and i guess i didn’t leave it in there uncovered long enough after that. it was still delicious! thanks for the idea! Thank you! I made this for Thanksgiving and it was great. A real keeper. This was very good, but mine turned out very different from the way this one appears. The photo looks sort of like a crustless quiche, the sweet potatoes and greens suspended in the creamy sauce. I did not have near enough sauce to immerse anything, and after it was baked, I could hardly see the sauce. Regardless, it was very tasty. And it really got better after sitting a day or two. Liked the leftovers much more than the fresh-out-of-the-oven gratin. I didn’t have a 9×13 so instead used two Ikea baking dishes–one rectangle, one oval. The rectangle one was much more successful because by the time I got to the oval for the last drenching of sauce, I’d run out. I didn’t have any more cream in the house, so I took some Greek yogurt and thinned it out a bit and made an impromptu sauce (at this point I was just hoping for any kind of dairy liquid). I also didn’t want the yogurt to do anything weird on top of the gratin, so I sortof just mixed everything together in the round pan and sprinkled cheese on top. I’m currently doing a side by side tasting, and while the properly constructed gratin is prettier and perhaps better tasting, the Greek yogurt experiment was not a disaster! Also, this is so delicious. Thank you! So good! Next time I plan on using spinach. The swiss chard was great but not worth the time to wash and prepare. The stems on my chard were pretty large – I recommend chopping them up real small if you plan on using them. Overall, something I will definitely make again! I like sweet potatoes and we planted some in your backyard. Thanks to your post because I have now an idea on how to cook it on other way..
OMG! This was so yummy. I used rainbow chard, not that that made any difference, but I thought it might as some color. Ha! Anyway, awesome success. Very tasty. And the baby is tooooooo cute!!! i tried this recipe because of an urge to cook homey fall fare after eating our tgiving dinner in a resort restaurant this year. the green and yellow chard i used complemented the small diced butternut squash (substitute) perfectly and the dish was amazingly delicious. the chard prep was no joke though! phew! Wow. This took me FOREVER to prepare… started at 5 p.m. and we are just now eating it at nearly 9 p.m. But oh my, is it ever wonderful. The flavors! The texture! I love chard but was skeptical about using the spine, but it’s lovely. I used red chard and it lends such a beautiful color. Next time (and there will definitely be a next time) I will enlist a sous chef, otherwise I love the recipe as is and won’t change a thing. Actually, I might enlist two sous chefs and double this… with a husband and two teens all taking seconds, we’ve just eaten it up! Just made this last night with rainbow chard. I skipped any elaborate chard preparation and washed, chopped, dried and tossed into the mix. I have to say I think it’s even better as a leftover lunch. Thanks for the post!! I’m sitting at my desk at work, eating the leftovers from last night. So, so tasty. I didn’t have any gruyere so just used bits and bobs of leftover cheese from Thanksgiving apps, and it worked just fine. I’m going to be sad when we finish it all up, which will probably be tonight. Well, it turns out I must have left my yams (comment 55) at the store. After my Thanksgiving host treated me to a roasted sweet potato (I’d stuck to yams up to now), I decided to try that instead. I used 2 pounds of chard and a pound of baby spinach (not sure why I ended up with that). And it was absolutely delightful! Only problem was taking off the tip of my thumb while figuring out how to slice potatoes on my mandoline. But the final product made it worth wearing a bandaid for a while. Served this with my vegetarian Thanksgiving dinner and it was the hands-down favorite. I didn’t the prep-a-day-ahead-of-time advice and this lunch turned into an early dinner. But man, it was delicious! I used a cup of portobellas in lieu of a half pound of chard and it looked pretty but the mushroom flavor was totally overpowered so I would stick to the original recipe next time. Will DEFINITELY prep a day ahead too… I’m a slow cook and 2.5 hours in the kitchen left me exhausted, before the dish even got in the oven. Love your blog Deb, thanks for the great ideas! Great idea for getting my daughter to eat her greens and not just candied sweet potatoes this time of year. Glad to know it can be made in advance, because it’s nice to have something that can be thrown in the oven but made the night before. I enjoy your writing, recipes and beautiful photos. Thanks for this twist on swiss chard. I made the gratin this weekend, omitting the cheese, and substituting olive oil for butter. I added lots of fresh herbs; sage and extra thyme. I also added additional garlic to onions for the chard mixture. When assembling I started and ended with the yams, topped with a drizzle of olive oil and sea salt. It was light delicious. I baked a little longer (1hr 15 min) yams soften into the sauce and chard. The family loved it, not a drop left over. Next time I’ll try soy or hemp milk to make it totally vegan. omg deb, made this last night. it was delicious, even with 1% milk (what i had on hand) rather than cream. btw, this was my first time making a bechamel and i’m not sure i did it right. should the roux be completely smooth? mine was a little grainy with flour lumps — should i have sifted the flour in slowly? thanks! Not needed; you just want to whisk the milk in slowly, whisking constantly so the roux slowly goes from a thick paste to a sauce. Just wanted to chime in here: if you halve this recipe, make the full amount of the sauce. I just finished assembling the gratin (half the recipe) to bake tomorrow, and there was no drenching of anything. I kind of had to spread a thin layer of the sauce on top of the greens. I even added a bunch of extra milk just to get some liquid going, but I’m not sure it was enough. I’ll still bake it off tomorrow, but I’m glad I have a back-up plan for dinner. Ok, first things first: Deb, I am terribly sorry for ever doubting you. I baked off the half recipe, and while I’d still make more than half the sauce next time, it was fan-freaking-tastic. Plenty of liquid, and all the flavors just melded together beautifully. And now my husband wants me to make this for Christmas dinner. Screw back-up plans! Um, I think I just visited heaven. Made this tonight and all I can say is thank you for posting this recipe. Uh-Maze-Ing!!! I made this last week, I used half chard and half kale and I have good news to report, we both loved the final product. My fiancee didn’t recognize the sweet potato, he thought it was butternut squash (a very common ingredient in our kitchen). One tip is to use a salad spinner to get the excess water off the greens, I had a bit too much liquid remaining after the baking. A must try at least once, thanks. I’m about to make this for the second time. First time was a huge hit for Thanksgiving. I made it with collard greens instead of swiss chard (my husband thinks swiss chard tastes “like dirt”). My brother is gluten free and so I used some corn starch for the roux the first time–worked pretty well! When I made this dish it was delicious!!!!. Everybody raved about it. Thanks for sharing the recipe. I was wondering if I up the Swiss Chard to 5LBS., would it be too much, when I made it I just thought it had more sweet potatoes and not enough Swiss Chard. Also, what’s the verdict on reheating the cassarole after it is baked and frozen. I made this last night and it was fabulous! The way the cheese and chard browned on top looked like it would taste burnt, but instead I got this smoky almost bacon like flavor and texture. I could only find red chard so the whole thing looked darker and less pretty, but the taste more than made up for it. I made this as one of the sides for Christmas dinner with friends. It was amazing and got raves from both the vegetarian and “I hate vegetables” teens at the table. Hi Jackie — I have not tested this with 5 pounds of chard. I see no reason, however, the more greens cannot be added but you might find you need additional bechamel to keep the dish from become too dense. The gratin reheated just fine from frozen; I first left it in the fridge all day so it was mostly defrosted. I made this for Christmas, but used spinach instead of swiss chard. It was excellent! Thanks for posting it – what a great dish! I made this today, substituting Jerusalem artichoke for the potato. Delish. I made this for my regular Thursday dinner crew (Grey’s and dinner – can’t beat it!). Didn’t have chard at the store – so I used collard greens – wayyy too strong, don’t substitute! I’ll try it again because the cheese was perfect, the potatoes were perfect, but there was way too much tough collards greens – for you cooks that can make due, substituting doesn’t work here! I saw some GORGEOUS organic rainbow chard in the store yesterday I’m going to try with this. Also, I’m considering adding pancetta…what do you think? Did you see where this recipe was mentioned in the Smithsonian Magazine? 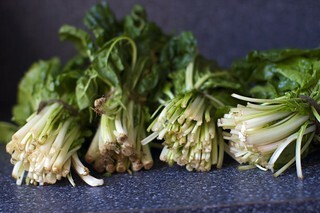 (http://blogs.smithsonianmag.com/food/2010/01/20/five-ways-to-eat-fresh-fennel) Congrats! This dish looks so delicious-I love the combination of the sweet potatoes with swiss chard! I can’t wait to try this recipe this week! This dish is a hit with everyone. I’ve brought it to two events and always get requests for the recipe and an empty casserole dish in return. I like it with a sprinkling of red pepper flakes on mine. Thanks! Amazing! I made this for the third time with sweet potatoes, chard, spinach, swiss and parmesan (what I had on hand) and it was, as always, delicious. Don’t skip the salting after every layer . . . it really makes a huge difference. So delicious! Just put my fork down and am considering sneaking a little spoonful more. I will definitely be making this again. My tray was quite large and I was worried I didn’t have enough sauce but it was perfection. Deb, you have gotten me on a real gratin kick! I just made this tonight and loved it. I modified it to make the prep quicker–used a mix of cream and broth instead of the roux. I added Parmesan too. The taste of the browned Gruyere and Parmesan with fresh thyme and sea salt over the chard . . . oh my goodness. I will be thinking about it for days. (I broiled it at the very end.) I’ll make this again just with the chard. But loved the combination of the veggies. You rock. my roommate made this soon after it was originally published with a blend of gouda and gruyere–i think she used more cheese than the recipe originally called for. it was absolutely delicious, freeze-able, and super rich (to the point where you couldn’t eat more than one square a day). i just made it again for my family and used a blend of gruyere and white cheddar. i also made a really great modification that i thought other people might be interested in: QUINOA! i got the idea from an epicurious recipe (basically the same exact gratin but with quinoa). make a cup of quinoa (1 cup quinoa, 2 cups or a bit less water) and mix it in with the cooked chard and onions. proceed as usual. i actually preferred the gratin with quinoa; it was much less mushy and less creamy. the quinoa added a really nice healthiness and fresh texture in contrast to the mushiness of the potato and cooked chard. i also took the gratin out 20 minutes early, which helped to make it less mushy, and had to put foil over the top about 20 minutes in so the cheese didn’t get too crusty. my little sister who hates new things and had never had quinoa or chard before LOVED it. a big hit with everyone! i don’t even really like sweet potatoes, but i LOVE them in this dish. I meant to comment way back when I made this, on Christmas Eve. I substituted kale for the swiss chard because I couldn’t find any chard at Publix. It was incredibly amazingly good! My fiance loved it too, even though he was a bit skeptical (especially since it took me so long to make–I’m not as good in the kitchen as you are!). It’s officially our annual Christmas Eve dinner. Thank you! I made this tonite with freshly dug white potatoes from my boyfriend’s grandparents’ garden, fresh kale, and smoked gouda. Amaaaaaazing and so much better than just regular potatoes au gratin. Hello Smitten! I have just stumbled across your website and I am loving it. I tried your yogurt cake last night as my first SK try and it was fabulous! I have a question for you. Do you think this gratin would work with swiss chard and purple potatoes? I haven’t cooked with purple potatoes before so I’m not sure how they would do. Thanks! Made this after coming home with rainbow chard and fresh white potatoes from the farmer’s market! I imagine it would be even better with sweet p’s. Soooo delicious. I baked it uncovered most of the way and then refrigerated it for a couple of days b/c we were having a large weekend gathering. Reheated slowly for about 45 minutes covered and turned out great. I just made this and it came out FANTASTIC, but I think if I ever make it again I will have to use the frozen spinach like Deb says can be substituted. Fairway on 125th (I’m also cooking in a tiny kitchen in NYC!) had such gorgeous swiss chard that I had to try this out, but cleaning and cooking the 3 pounds of it took me hours and I really lost steam. I was so pleased by the result but I don’t know if my non-foodie friends would really be able to tell the difference between the chard and frozen spinach. Thanks for a great recipe!! Oh. My. Dear reader, the smells you will smell while preparing this beauty are… to die for. But the aroma that wafts as you pull the gratin from the oven . . . unspeakable beauty. A whole year after you posted this recipe, Google brought me here because I had a big bunch of wilting chard, a pound of yams and an assortment of dried up cheese, that I was determined to use up for dinner tonight. I too, always found yams to be too sweet unless cut down with certain ingredients. It was delicious! Even a hit with my 2-year-old. The orange and deep green contrast was pretty too. Time was a big constraint, so I cut some corners and managed to do the dish from start to finish, in about an hour (half of which was the baking where I could enjoy an appetizer while waiting). Thanks for the inspiration, will definitely make this again soon. THANKS. That’s how my mom used to make scalloped potatoes (cornstarch and grated cheese in between layers of potato and onion, whole milk poured over all) and it was always delicious. I didn’t think of trying this method, but you did. Have been meaning to try this recipe out for a while, so a dinner party for 5 vegetarians seemed like just the opportunity. I assembled the whole thing the night before and popped it in the oven straight from the fridge an hour before dinner – made as posted except I used fresh spinach not chard (stems and all) and less gruyere (about 25% less…I ran out). We left the house while it was baking and returned to a most lovely and welcoming aroma….and everyone suddenly developed an appetite! It tasted amazing, rich and satisfying and very balanced. I’ve was asked for the recipe several times (of course I referred everyone to this site). Baked uncovered it was not wet at all but also not overly dry. Thanks very much Deb. I was looking for a recipe for greens so was quite pleased to stumble upon this recipe. I baked it with collard greens instead of swiss chard and it was delicious. It is definitely a recipe I shall make again. I made this last year and my family loved it! This year I have a guest with celiac disease… do you know if I can use cornstarch in place of the flour to make this dish gluten free? I made this last night to bring to a dinner party. It was a hit and 8 of us easily finished it off despite it being a side dish. I subbed fresh spinach for the chard with good results. Next time I might make a few changes. I would change the potato and greens ratio, perhaps 3 lbs potatoes and 2 lbs greens. It felt a little like creamed spinach with a few potatoes in it. Also, I would cut my potato rounds thicker because they were too soft in the finished product and fell apart when you put your fork into them. Or perhaps I could just reduce the cooking temp and/or shorten the cooking time. Will definitely be making this again and might consider halving the recipe for a smaller dinner at home. Delicious! I used butternut squash and it didn’t take an hour to cook, more like 35-40 minutes. I also didn’t have to drain the chard – I just cooked it until all the liquid was gone. YUM! I know this is a year late but! I made this with kale and it was miraculous. the kale wouldn’t submerge and so crisped up nicely on top. and it required no straining! I’m a year late also, but made this and it was delicious! My boyfriend hates gratins… so was planning to eat something else until this thing popped out of the oven. He loved it. Never in my life made swiss chard and this was incredible. I just asked him what he really wants me to include in the Turkey Day menu and he insists on this dish (asked me to double the size of the recipe LOL). I cut my potato rounds at different sizes…some thick and some thin, and by far I preferred the thicker rounds in the dish. Looked beautifully delicious. Found this recipe as I wanted to use up all the swiss chard in my garden and I had the best surprise this fall. We had planted sweet potato vines for decorative planter boxes this summer because I love the color and the growth of these plants. This fall, as I’m digging up the planter boxes, I see these huge tubers. Hmmm. I thought. Then realized they were the tubers from the sweet potato vines! And not a bunch of little potatoes. Just one HUGE tuber per vine. I asked the local CSA boys if we could eat them, and they said, with their dreads bobbing, TOTALLY! So here I am making this recipe. I’m kind of new to the whole local food system idea, but this thanksgiving, all my sides are from my garden. It feels great. And I am actually using the chard in a cauliflower and mushroom gratin, but not a cheesy one. Just the veggies and a bread crumb topping. Had made this before but used kale tonight for Thanksgiving and it was delicious. Thanks for this recipe. I had the same problem as post #271. There wasn’t enough bechamel sauce when it was all said and done, to really create a gratin-y dish. What am I doing wrong? It was delicious and definitely better for lunch the next day, but it looked nothing like yours. Maybe I let the bechamel thicken too much? I have tons of yams that need a destiny. Thanks! I will add my WOW this is a great recipe to everyone else’s. I too had the very last chard to rescue from my garden before it got snowed under, and a bag of sweet potatoes picked up for pennies on the pound before Thanksgiving. I too didn’t need to drain the chard- I think since it was starting to get tough, any liquid it exuded was cooked off by the time it was cooked through. I also added a pinch of white pepper to the bechamel. Even though it didn’t seem like there was going to be enough sauce, the whole thing cooks down and condenses, and I liked that there was no one predominant layer going on, but it had all truly melded together. The aroma of this stuff cooking is truly more than the sum of its parts. I will make this again! So glad I found this. Thank you! Did you ever get anywhere with persimmons as suggested in these comments? I bought one today and haven’t a clue what I should do with it, though I saw a recipe for marmalade and I LOVE marmalade…. I made this a couple of weeks ago, and again at my husband’s urging for dinner tonight. Both he and I LOVE this recipe. I substituted kale for the swiss chard, mainly because I have heaps of kale from my garden. I hope you think about including it in your cookbook–it is a real winner! I made this with the spinach subsitution you mentioned for my future mother-in-law who is an exteremely picky eater, and I believe this one dish may have finally won her over. Thank you for saving the day! I’ve never made anything off of here that wasn’t amazing… next up, your homemade marshmallows for my friends’ Christmas gifts. Wish me luck! I made this for an early x-mas party this weekend and I was not all that impressed with it. It was really watery (and I did squeeze water from the greens after wilting them) and I thought it lacked in flavor. It was ok…but not much to write home about. It does look very pretty and smells wonderful as its cooking! I tried this recipe and it was great! I am helping my mom put together Christmas dinner because she’s been having some vertigo issues, and I’m going to bring this one out. I wanted to let you know of one recipe modification to make this recipe gluten-free/paleo. For the roux (for the Bechamel sauce), arrowroot is a great substitute for flour. I forgot to mention, the above comment would be useful for #291 and #318, who were thinking of using or used corn starch. I’ll bet corn starch would totally work, but arrowroot might be better for people trying to avoid prolamines altogether. Wow. I just made this (substituted Gruyere for grated Parmesan) and it was amazing. It honestly tasted like eating lasagna – meatless, delicious, healthier lasagna. Thanks for the great recipe! Made this today as a side with Christmas dinner, and let me tell you, this is so delish it made my head spin! Wowowowow! I will definitely be making this again. Thank you for another amazing dish! I made this over the weekend, using butternut squash, fat free half and half (didn’t have anything else in the fridge), and fontina (again, it’s what I had on hand). If you doubt this recipe, let me tell you, this is MUCH MUCH BETTER than the sum of its parts! Try it! Adding my “fantastic recipe!” to the list of comments. It made a perfect vegetarian Thanksgiving entree. Added some spinach & beet greens to the chard and subbed in Parmesan cheese. Elena, in response to your comment, I had a similar problem, also because I think I thickened the sauce too much, and once the unbaked gratin was in the baking dish, I poured little bits of milk on top and kind of mooshed it again to add more liquid. It worked. How did I live my life before this? One of the best things I ever put in my mouth. I had to blog about it. :) But I left the pics up to you because how could I top those amazing yummy adorable pics? I can see you saying Yam-Yam to that adorable baby and- be still my heart! Thank you for this. I will be in a sweet potato, swiss chard coma for months to come while this weather holds out! Fabulous! Our 7 month old loved it. Thanks! i tried this last night and it was AMAZING!!! I can’t wait to make it again!!!! Most of my experience with sweet potatoes (or yams) is at Thanksgiving where we have them baked or mashed with carrots. I was doubtful that yams would taste good covered in cheese, but I’m so glad I was wrong. I divided this recipe in half and substituted kale, and it was the hit of my Oscar viewing party. Thank you! Just moved to Hawai’i and tried this recipe with Hawaiian Purple Sweet Potatoes which have a richer taste than their mainland counterparts. It came out beautiful! The purple and green colors were amazing. Thanks for the inspiration on this one. It’s going in the normal rotation for dinners. Deb, we tried this recipe at our family’s Easter dinner today for the very first time, and I’m happy to report that it was delicious. You weren’t kidding about what a major pain in the tuchas processing the swiss chard was, but it was delicious and provided a nice, mineral contrast to the sweet potatoes and ham. Thank you for sharing and for your clear instructions! I made this for Easter today for a family pot luck. It was a lovely gratin with a souffle-ish feel to it! I tried it with spinach, mozzarella, swiss cheese and dried thyme. It was awesome. I will have to figure out how to get rid of the watery-ness somehow but nonetheless a great recipe! Is it too late to love this? I made it with kale. So delicious!! I made this the other night, swapping skim milk for whole and Emmenthal cheese for Gruyère. It is very tasty, but I have to say, I don’t think I will be making it again unless I have an assistant in the kitchen. Prepping the greens was SO MUCH WORK, especially on a weeknight after work. But I do love the combination of swiss chard and potato with Béchamel sauce. Just made this on Monday. YUM! Thank you so much. I just linked your photo over to Pinterest so I remember to make it again. I made this and thought it was tasty but doubt I’ll do it again. I found it very labor intensive what with all that chard. It’s definitely a hearty, rich, creamy, delicious gratin and I think it would go perfectly with Thanksgiving dinner, BUT: My qualms here were the amount of labor it took to make and that it didn’t reheat well as leftovers. The leftovers turned a little mushy and had a green liquid oozing from them. It’s probably my fault for popping it in the microwave but we had lots and lots of leftovers and most of it went to waste. Oh, and one more thing, I would omit the chard stems if I made this again as their taste and texture was not very appetizing to me. Thanks for coming up with such inventive and season-friendly recipes! Delicious. Thank you! Was afraid there wasn’t enough béchamel, but the proportions were perfect. I loved this recipe; thank you for sharing it! I did swap butternut for the sweet potato and think that substitution was spot on. My guests were full of compliments and I can’t wait to make this again for Thanksgiving. @rene, I made this over the weekend specifically to reheat during the week…it was a teeny mushy but i didn’t have any green ooze. I definitely would make this again to reheat, maybe undercooking it a bit with the first bake. My mission this winter is to spend weekends in the kitchen, so I have a fridge of easy, homemade deliciousness waiting for us at the end of the work day–@deb, i love your freezer-friendly tags, thanks! I made this ahead as stated was possible, (this morning) and the pulled it out (just now) to bake, and the swiss chard has turned the bechamel pink! I am sure the flavors won’t be affected, but it doesn’t look especially appetizing anymore. I made this with a mix of greens (Mizuna & spinach) rather than chard and it turned out very well. I also used 2% milk for the roux with no ill effects, for those who are concerned about the heavy cream. Utterly delicious; will make this again. Hi Deb! I made this last year for Thanksgiving, and it was delicious. I’m making it again this year, but this time it’s going to have to share oven space with turkey parts that are roasted at 275 degrees. I was wondering how I should handle this. Would it bake properly at 275 – just take longer? Or would I be better off baking it in advance and warming it up at 275? Either way, I’ll be able to turn the temperature up at the end for browning. Also, any idea of the time it would take at the lower temperature? I am a very precise cook, and I get all nervous when I have to deviate from a recipe! Not to mention that I’m 6 1/2 months pregnant, and I think I’ll cry if I ruin it! Thanks so much. And congratulations on finishing your cookbook – that must be a wonderful feeling! Can’t wait to read it! My daughter made this for our Thanksgiving dinner with kale. My personal favorite of everything on the table. I made this for Thanksgiving yesterday, as we had a vegetarian guest and I wanted something more savory than caramelized sweet potatoes for it. It was a HUGE hit and the six of us polished it off! (Although mine was smaller, I decreased the amount of chard and just did enough sweet potatoes so it felt right.) I should probably have prepared it the day before, as we ended a little tight on time, but it was definitely worth the effort. I’ve made this a couple of times and it’s delicious. Works very well as a vegetarian main dish for a pot luck or holiday dinner. I have just prepared this dish for our Christmas dinner and it is currently in the oven. It sounds delicious but what a pain in the tush to prepare–hours of prep, umpteen pots and pans to wash, and the raw ingredients cost nearly as much as our Christmas ham. Now we wait. I’ll check back in with the final taste results. It better be good. All right, so we just finished our Christmas dinner and the swiss chard and sweet potato gratin was….. Very savory. Something I would be happy to eat again and again. But still quite a production to prepare and the price of gruyere cheese is mind numbing. But I can’t envision another cheese which would work quite as perfectly for this recipe. Need to find a cheaper source of gruyere and we’ll be having this regularly. I’ve gotten a lot of sweet potatoes in my CSA this winter, and I was rather stuck in a rut about how to prepare them. Looking through your archives, though, yielded this lovely gem of a recipe. I ended up using some white-fleshed O’Henry sweet potatoes on the bottom layer as they don’t mush quite as much, but stuck with the beautifully sweet Beauregards for the top layer. I also switched up the cheese to Muenster and the winter green to some baby arugula I also received from my CSA bulked up with some spinach (this recipe certainly doesn’t hold back with the leafy green goodness!) and was very pleased with the result. Thank you very much for the delicious new (to me) recipe! My family LOVED this. I used only 2 pounds of spinach, which was all I had on hand, and asiago cheese. I’m looking forward to serving this again with a full 3 pounds of swiss chard. I just made this dish tonight and it was so so good! I followed your directions exactly and it turned out perfect! I will definitely make it again! Now I know what to make when I have vegetarian friends over for dinner! I made this last night. It is very tasty and beautiful but it is a lot of work, took such a long time and my kitchen was a complete mess afterwards :) There wasn´t enough bechamel, so I had to remake some for the second layer in the gratin. Very good recipe non the less and I feel I will reuse sweet potatoes and swiss chard together again. Just made this (and ate it.) It’s unbelievably good. Late post to this, but I don’t have a deep 9×13. Any ideas if I could just use a cast iron dutch oven pan? Jess — I think so. Go for a bigger one so you have good surface area, if you can. i made this for dinner and it was amazing! I added some kale and spinach to it since i only have 1 bunch of chard. ugh devouring my 3rd slice now. Mine was runny even after draining the greens well but i dont care. yum! I made this using butternut squash and kale, and it was really good. My weights on my vegetables weren’t what Deb used (about a pound of squash and less than a pound of kale – it was about 2 cups cooked down). The bechamel didn’t nearly cover all of my layers; not sure where I went wrong there, but I added 4 T of milk and covered it with foil for the first half hour, and it came out fine. The squash didn’t hold up as well as the sweet potatoes might, but it tasted amazing – so we only got four portions out of it instead of 12. We made this tonight for dinner and it was amazing! We successfully substituted kale for the chard, and cut the recipe in half. I was skeptical of sweet potatoes prior, but this will definitely be made again. Thanks for opening the door to sweet potatoes for me! It’s a keeper! This was amazingly flavorful. The sweet potato is a nice change from the usual gratin. I used much less cheese (cholesterol issue), and it was still fantastic. I dusted each layer with parmesean (didn’t have gruyere), and I added a lot of nutritional yeast to the sauce to make up for the lack of cheese. I also added a layer of toasted breadcrumbs on top. Made this tonight and it was delicious. I used smart balance and 2% milk for the roux, and definitely cut back on the cheese. I also used butternut squash instead of sweet potato. Nonetheless, it was super tasty and completely demolished by the end of dinner. No leftovers whatsoever! I’ll be making this again–maybe for Thanksgiving? I’ve been making this for Thanksgiving for many years and we only have it once a year and it is my favorite thing at dinner. I can’t wait! The best part of this great recipe is your writing. So funny. Keep going. I made this for Thanksgiving and it was, by far, the hit of the meal. Yum! So easy too. I made this for dinner last night and it’s AMAZING! I used red chard which was just fine. Thank You! I used a mix of sweet potatoes and turnips (as well as turnip and collard greens instead of swiss chard because it was what I had on-hand) and it was still delicious. I despise sweet potatoes because I’ve found most recipes make them too sweet (much like yourself) and I’m so happy I liked this recipe! I live in New Orleans where sweet potatoes are everywhere (pies, french fries, etc.) and I felt like I was the only person who didn’t like them. But, thanks to you, I’ve discovered that anything covered in enough bechamel sauce and cheese will (naturally) taste delicious! We made this dish last night and it was outstanding. 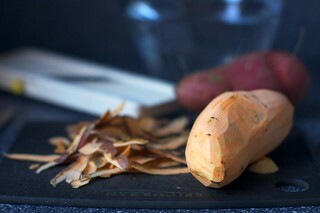 We used Japanese Yams – which are white – and otherwise followed the recipe. It was met with rave reviews and we will definitely make again. Thanks for the great recipe! we made this as a side for Christmas dinner – so delicious and got raves even from pickey eaters. (A few guests asked what swiss chard is before trying(!)) Replaced half the milk with Almond milk with good results. Will likely do a lightened up version for weeknight meals at home. A totally comforting dish with the warming nutmeg. Thank you! made it again for New Year’s Day – total comfort food! Think this would work alright with 1 lb of each, kale, spinach, and Swiss chard? I wasn’t sure since I have baby spinach and it weighs a lot less so a lb of spinach could be overdoing it. I’ve never cooked kale and chard together either, thoughts? Just a quick suggestion for working with chard or other leafy greens: scissors. You can use them to quickly strip the leaves from the ribs. I have a pair I keep in the kitchen and also frequently use them to “chop” fresh herbs, which are so delicate and bruise easily. Made this last night, it was good though heavy on the prep time, definitely not part of a mid-week meal. Special enough for a holiday meal, too bad my family doesn’t like to stray this far from traditional. I would love to replace a sweet potato casserole with this. First time making gratin and have a question. I baked it until all the liquid absorbed, but seemed like it curdled a tiny bit. Is this expected? I used 1% organic milk. Texture and flavor was good, but just curious about the ‘curdling’. Also, added only the stems of the chard. I am feeling VERY motivated this fall and want to get a jump on Thanksgiving stuff as soon as I possibly can! I’ve read the comments for different incarnations of making this in advance, but what’s the consensus on assembling it, freezing it UNBAKED, and then baking directly from the freezer (or putting it in the fridge 24 hours in advance and then baking it from the fridge)? And if this is indeed a possibility, how far in advance can I assemble it and put it in the freezer…a week? A month? Made this for the first time last night and it was absolutely amazing. Better than expected. I used kale and it was great. I didn’t drain the kale and didn’t notice any problem from that. It did take longer to make than I expected, but since it was the main, it didn’t matter. And I think having done it once, I’d be able to throw it together a lot quicker the next time. My family loved it too. Said it was better than a traditional gratin, which is saying a lot. I only recently got them to try kale. Thanks for the recipe! Also a big hit at our house! Made with kale, not drained. Made a half batch in an 8×12 pan and baked 40 minutes, covered for the first 15 because I reduced the béchamel a bit too much and I thought there might not be enough moisture since kale is not as wet as chard. It came out great! I will make this again for Thanksgiving! Skim milk worked fine- very flavorful. If halving the recipe, should I cook for same amount of time? I made this last night and it was delicious, though more work than I was expecting. It might not make it into my weeknight rotation but this would be a great addition to a dinner party. I love this dish, but I never know what to serve it with because its so heavy and filling. Because its a bit of work, I like to make it for guests, but don’t feel like its quite substantial enough to stand-alone. What main would you serve it with? This sounds fantastic! Do you think it is something that could be done in a crock pot? I know it wouldn’t look near as beautiful but with oven space being sparse on Thanksgiving I am always looking for alternative cooking methods! Amazing! Made it yesterday, baked it today for Thanksgiving. Best, most comforting fall potato dish ever. Swiss chard, sweet potato, gruyere and garlicky cream make up a divine combination. I am very thankful for this recipe. This one is a keeper. I made this for Thanksgiving as well, but didn’t have as great fortune in the results. The gratin was more wet than I would have liked and my sweet potatoes weren’t tender enough, but maybe that’s my own fault as I ended up used a I ended up 15.8″ x 7.5″ casserole dish and should have more precisely sliced the 1/8″ slices? Also, I ended up using 10 ounces of pre-washed and chopped swiss chard (about 9 cups) and still felt that the chard to sweet potato ratio was too heavy on the potatoes. Maybe that was because I over-wilted the chard while cooking? I have to say, though, that when I reheated the leftovers in the microwave a few hours later for seconds, the gratin was much better. I’m about to make this for the 4th year in a row for an annual Christmas party among friends. It’s always been a hit and is my go-to contribution to any potluck style party during the holidays. I’m so glad I found this site and this recipe, and happy to see [what seems to be] our efforts paying off! Love, love, love this dish!!!! My contribution to family Christmas dinner this year – a huge hit – everyone loved it & everyone asked for the recipe. Takes a bit of prep (chopping) time – but I think I will be much speedier 2nd time round…… I used one bunch red chard & one bunch green (use the entire chard – stems & leaves!). I used whole milk instead of cream – and probably used a bit more gruyere than called for. Delicious!!!!!! I made this last night. It was so good. One thing, I didn’t bother to peel the sweet potatoes, just took off any rough spots. It cooked up fine and no one could tell. Also, I added 1 lb. of collard greens with the swiss chard to up the variety of green flavor. Delicious! I made this dish for the first time two years ago, when we got swiss chard in our csa box – we had to google it! My husband doesn’t like sweet and savory mixes (and as a good Argetinean he’s far more of a meat eater than veggie eater) so I was convinced this would be a one-time effort. Two years later, it is officially his favorite dish – beating his favorite meat cut- and we make it every other week. THANK YOU! Thank you for this delicious recipe. I made it and did not quite expect it to turn out that well. Your notes and recommendations are right on. This will be shelved in my recipe binder!!! Delicious! I subbed butternut squash for sweet potato, used a mix of chard, spinach, and kale, and used whole milk instead of cream because that’s what I had on hand. It turned out great, even with all of the substitutions! Such wonderful flavors, and it was even better re-heated the next day. Everyone in my family loved this! I didn’t have milk or cream so I used coconut milk so I was a little worried but, it was delicious. Unfortunately, I didn’t buy enough chard so had to fill in with baby kale greens and it was still delicious! Thanks so much! I had every intention of making this with swiss chard but I went rogue and used a huge amount of spinach (thank you 2 for 1 bag!) and then changed the cheese mixture to half gruyere and half swiss. I also added a minced green chili while sautéing the greens. Whooo boy! It was just comfort comfort comfort all the way. I made this as a Thanksgiving side dish this year for the first time and OMG it’s delicious! I used our homegrown chard and light instead of whole milk, it came out great. A pretty easy dish to make. It’s a keeper! This is a very time-consuming recipe but came out very nicely. I used about 1 1/4 pound swiss chard and 1 1/4 pound kale; maybe this is a result of the chard/kale mix, but 3 pounds of greens would have been too much for my version. I was a little confused about how to structure the sweet potatoes, but it’s clear to me now that you really are supposed to use half of them in each of the two layers. In the future, I think I’d also suggest making about 3 cups of bechamel instead of 2. Finally, mine was done in less than an hour–I’d suggest testing it around 45 minutes. The leftovers have reheated nicely for lunch. I love sweet potatoes in certain applications – mashed or in fry form. I’m not sure about sweet potatoes and kale, though – could we substitute regular potatoes? And I often buy huge bags of washed kale or spinach at Costco, then cook them down and freeze. I’m wondering how much frozen, cooked greens we’d use here. 5-6 cups seems like a lot – about how many ounces would that be? Lissa — It’s a lot because this is actually a massive, deep gratin, definitely meant for a Thanksgiving crowd. I’ve only made it with the amounts I suggested (3 pounds fresh Swiss chard or 5 to 6 cups frozen spinach) but there’s no reason not to adjust this to however you think you’d prefer the volume. This looks like the perfect way to use my CSA greens! I might also try freezing a batch to use when my little one shows up (sometime in the next three weeks)! I am hosting Christmas dinner this year and this will definitely be my sweet potato dish!! Made it tonight for dinner and it was amazing. I needed more greens, and used a mix of Gouda and asiago cheese, because that is what I had. So happy to have leftovers tomorrow. This is my go to side for Thanksgiving. I’ve been making it since you published it and always get rave reviews from everyone. Thank you!! Do you really need another comment that this is a fabulous recipe? If so, here it is! Perfect for Thanksgiving as well as a weeknight dinner. made this tonight with feta cheese and added white beans for some protein, came out delicious!! I made this last night (well, a half-recipe, in an 8×8 pan). It was good, and very pretty, but kinda bland. Maybe it was because half-a-recipe of bechamel wasn’t enough for an 8×8 pan. Maybe my cheese was not cheesy enough. Maybe I’ve been eating too much Ottolenghi food and have come to expect stronger flavors. I love most of the SK recipes I’ve tried, but this is something I’d make again only when the Vegetarians come to dinner–and then I’d add a big pinch of cayenne. Hi Deb, thanks for this recipe, made it many times and it is absolutely delicious! For freezing, I was wondering if you would suggest baking first then freezing; or just assembling, freezing, and then baking off only when ready to serve. Thanks in advance. For this, I’d bake then freeze. You can defrost it for (at least, it’s very thick) a day in the fridge then gently rewarm it in the oven. I made this and halved the recipe for an 8×8 pan. Used Tillamook sharp cheddar. i.o. gruyere and two types of kale i.o. chard… It was hard to make it the first time, I kept having to read the instructions over and over. But I’m so proud it turned out gorgeous with a crispy top and perfectly baked center. Even halved, it took an hour to cook. I think I’ll make it again for Thanksgiving this year. It made the house smell like fall! Anyways. Thanks Deb! This one is fantastic! I made this tonight and it was delicious! The chard was pain. To get to 3 lbs, I had to get five bunches from whole foods. I might try to simplify this step next time or just use less. Even though I thought I followed all the directions regarding pressing the water out of the chard onion mix, I still had a LOT of water in the baked gratin. Still tasted good, but used a slotted spoon to drain the servings. It’s possible that I should have cooked the chard longer – i.e. beyond wilted and close to very well cooked. My chard also had thicker stems than what’s pictured. People are still making this and it’s still great. Use kale as that’s what I had, just as good. Could have used a touch more umami flavor… maybe I went too light on the garlic? Any vegetarian suggestions for that? Just made this tonight. Unlike many of the comments, my husband and I did not find it to be bland or under-seasoned. To avoid under-seasoning, I replaced the nutmeg with red pepper flakes and added them liberally to the roux as well. I also doubled the herbs. We likewise did not find the dish to be too runny – I left the chard to drain in a colander over a bowl while I prepared the roux and even while assembling the final dish, which perhaps helped. In short: absolutely delicious. We look forward to the leftovers. This dish was wholly unpleasant to make. Stemming three pounds of chard ant then trying them is no one’s idea of a good time. However the results were incredible. Amazing flavor with all that cheese and butter. Healthy it is not but tasty it certainly is. Sorry, this comment was semi-literate; I typed it on my ipad while laying on the couch. In short, this recipe is absolutely delicious but it was not very fun to make initially. Made this last night and it was really good. I only used 1.5lbs chard because I’m trying to get my husband and 5yo to like cooked greens. They reluctantly ate it and then said it was pretty good after a few bites. I used red Chard and the color was beautiful. Even using only half of the Chard that was called for, it still had liquid on the bottom of the dish after you remove a slice. It still held shape so maybe next time I’ll use my hands to squeeze the chard to get it dryer. I will make this again! Ps your babe is adorbs! I just made this, and it was wonderful! I was worried about over- or under-seasoning, but it turned out just right. I added just enough salt & pepper to the cooked greens so that they started to taste subtly seasoned, but not bland. I did the same with the bechamel, very slowly adding salt and pepper until the flavor built up enough that I thought it’d contribute enough seasoning to the dish without going overboard. I followed the instruction of sprinkling each layer with a little salt and pepper, trying to aim for a light-but-not-too-light sprinkling each time. I also let the cream warm up really gradually with the garlic in it, and I noticed that this produced a really lovely infusion of delicious garlic flavor into the cream: what started out weird, with the garlic tasting raw and spicy, ended up all melded together and wonderful. I did modify the recipe to be gluten-free, as I have Celiac disease. To do this, I just subbed cornstarch for the flour. I was worried, but it turned out great! My bechamel was really thick and did not pour smoothly over my layers to coat the veggies nicely, so I used a spoon to spread it a bit (with limited success). In the end it turned out fine, despite the viscosity of the sauce. Everything melted and cooked together beautifully. All in all, I really liked this dish. It was pretty labor intensive for a weeknight, but at least it made a ton of food and turned out delicious enough that my boyfriend won’t mind eating it all week! Thanks for the great recipe! Hi – Have you ever done this recipe with Yukon Gold or Russet potatoes? My family demands a sweet potato and marshmallow casserole, but I would like to include a more “grown-up option” at the Thanksgiving table. I’ve made this as written and love it, so would like to know if I can swat the potato. Thanks and Happy Thanksgiving! I haven’t but my choice would be Yukon Gold for gratins. I think it would work well. Is it possible to substitute the Swiss chard for spinach or would it change the flavor too much? Spinach is just fine here. Smitten Kitchen is my go to for many recipes! I’ve made many of your recipes, but this is my first comment. I made this gratin for Thanksgiving dinner this year, and it was a HUGE HIT! Everyone loved it and it was simple to make! Thanks, Deb!! Wow. Wow wow wow wow. Made this last night and it was just divine. A perfect fall dish (even though it’s still a bit warm, I’m diving in). I only had one pound of chard and after an hour of baking there was the perfect amount (for me anyway) of water. I was also concerned that I was maybe over-seasoning but nope, Deb was right on the money, per usual. The flavor combinations here are just heavenly–kind of can’t believe I hadn’t thought of it before! Sweet, nutty, earthy, and wholesome. 10/10 will make again. Thanks Deb! I want to try this recipe, because I have loads of chard in the garden and because I bought sweet potatoes in the market this morning. but there is only one of me and 12 servings of this. So, what to do? Can I halve it, do you think? That way, at least I could share some with a daughter or a neighbour without overwhelming them. Wow. Made it for dinner, and it is FABULOUS. Making this much-loved recipe for Thanksgiving, but have a guest for which it needs to be gluten free. I see one person used cornstarch with mostly good results. Any other leads? Thanks! I know this won’t help in time for Thanksgiving, but I’ve made this several times now with subbing the King Arthur Flour gf all-purpose flour or their Measure for Measure blend with great results. Amazing! Deb does it again. Made this for book club tonight, and everyone had 2nds and 3rds. There were 6 of us (and a few other dishes) and there is only 1 serving leftover. That is HOW GOOD IT IS. I think my sauce was a bit too thick but it was fine in the end – just needed to spread it out with a spatula or spoon. I baked it at 400 (no foil) for 25 min, and the top was already browning, so I put foil on it for 20 min, before taking it off for the last 5 min. I thought that there would be too much liquid as the foil kept some in, but after letting it sit for 10 min before serving, it somehow magically disappeared. I used 0.45 lb of gruyere (more than called for) – and that was amazing! It was a lot of fun to make, but took about 1-1.5 hr of preparation before baking. I get a lot of turnips with my CSA share. I tried this recipe with half sweet potato and half turnips ( instead of all sweet potato). I love the result! Do you think I could substitute coconut milk for the heavy cream? Any other suggestions for a non dairy version? I have made this every year for Thanksgiving for the last 6 or 7 years but was planning on trying something new this year. My father-in-law called this week to make sure I would be bringing it, so I think now it’s officially a tradition. Even the greens skeptics love this recipe. Thanks so much for adding to our Thanksgiving table! I made this tonight. It was so delicious! I followed the previous comments and did the following: I squeezed out the liquid from the cooked chard leaves. I quadrupled the thyme and parsley so that each layer had a good amount. I salted and peppered at all directed steps. I ran out of grated Gruyere at the top so I sprinkled grated Parmesan on top. It was really, really good. I made this tonight. It was so delicious! I followed the previous comments and did the following: I squeezed out the liquid from the cooked chard leaves. I quadrupled the thyme and parsley so that each layer had a good amount. I salted and peppered at all directed steps. I ran out of grated Gruyere at the top so I sprinkled grated Parmesan on top. It was really, really good. Also, I doubled the cheese. I let it sit in the oven and there was not much liquid in the bottom of the pan. My sauce was thick and I dropped globs of it on and spread it over the designated layers. All of that chard really cooks down! Can I use fresh spinach? This gratin looks yummy. Yes, but of course make sure you wring it out well.